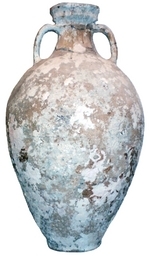 This is an amphora with a flat ringed base, a sharply curved neck, with a ring in relief at the level of the upper attachment of the handles. The rim is made by folding the clay back on itself, making the exterior face rectilinear or concave. The flat handles carry one, two or three grooves.There can be some slight variation in form (Laubenheimer, 1989 ; Bertucchi, 1992). Around 40 BC to the Augustan period. Production workshops are found in Gallia Narbonensis and Provence: Marseille, Puyloubier and Velaux-Moulin-du-Pont (Bouches-du-Rhône) (Laubenheimer, 1989). Distributed in small quantities throughout the whole of Gaul and as far as Germany according to recent research (Laubenheimer, 1989; Remesal Rodríguez and Revilla, 1991).